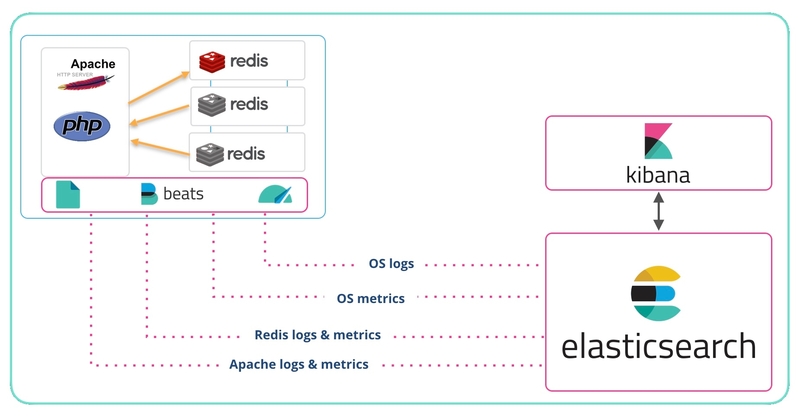 In a recent webinar, we gave an introduction to getting logs and metrics into the Elastic Stack. For people that prefer books over television, I'm going to dive into those same concepts again here in this blog. For my example, here is a simple application environment. An Apache HTTP server with a Redis backend running on Linux. Let’s look at how to get the operating system logs and metrics indexed into Elasticsearch, and visualized with Kibana. In this post we will talk about Beats, and specifically the System modules of Filebeat and Metricbeat. The System modules are described in the Filebeat docs and Metricbeat docs. The Filebeat System module grabs syslog and auth logs from Unix-like systems such as Linux and macOS. The Metricbeat System module collects CPU, memory, disk, etc. from the system. When you try this yourself, you can deploy modules for whatever you have running (Apache, NGINX, MySQL, Redis, Postgres, Microsoft Windows Server, etc.). Before we suggest that you deploy Beats and start sending data, let's have a look at this out-of-the-box dashboard. 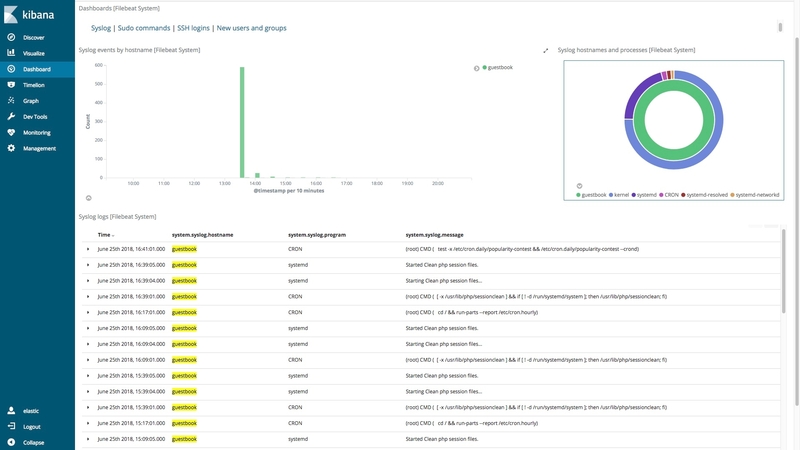 This shows you both graphically and in a columnar format the contents of your syslog files from whatever systems you have Filebeat and the System module deployed on. 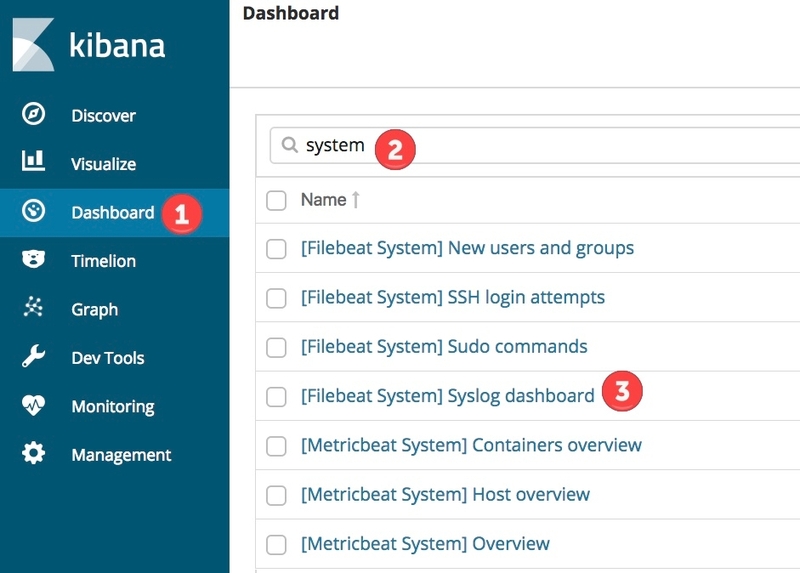 Let’s take a quick look at the Metricbeat System module and then we'll visit the great Kibana Home Add Data page that guides you through deploying Beats and modules. With a quick look, we can see if there are unusual things happening by looking at the shapes in the charts. Finding root causes by looking at dashboards is great, but to take things a step further we recommend that you proactively use Machine Learning and Alerts. Now it is your turn to give it a shot. Recreating what I did here should only take you a short time. First, I deployed the hosted Elasticsearch Service in Elastic Cloud — which you could do with a 14-day free trial. Alternatively, you can download and install Elasticsearch and Kibana locally. Both options work the same. Once you have your Elasticsearch and Kibana running, log into Kibana. Next, go to the Kibana Home by click on the Kibana icon in the top left corner. Then click Add log data. Choose to send System logs. Now follow the step by step instructions that are provided in Kibana, and you will have Filebeat sending system data from whichever system you have it installed on. Once you've finished that, repeat those three steps, but add System metrics this time. Note: If you want to send other data, for example NGINX logs, in addition to the System logs you don’t have to reinstall Filebeat, just run the commands to enable the new module, setup the module, and restart the beat. To see a full list of steps, please consult the Filebeat Modules and Metricbeat Modules documentation. Acquisition (file paths, ports, etc.) 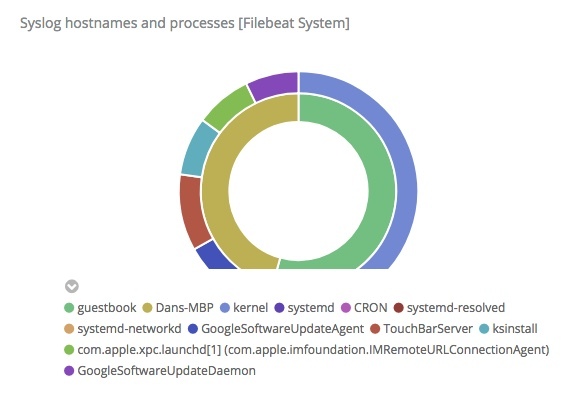 information got added to the Beat — For example, if you were running Filebeat on Linux and enabled the System module Filebeat would look for /var/log/syslog (among other logs) tag the records and send them on to Elasticsearch Ingest Node. Index templates for each log or metric type get added to Elasticsearch so that the data is parsed, stored, and indexed efficiently. 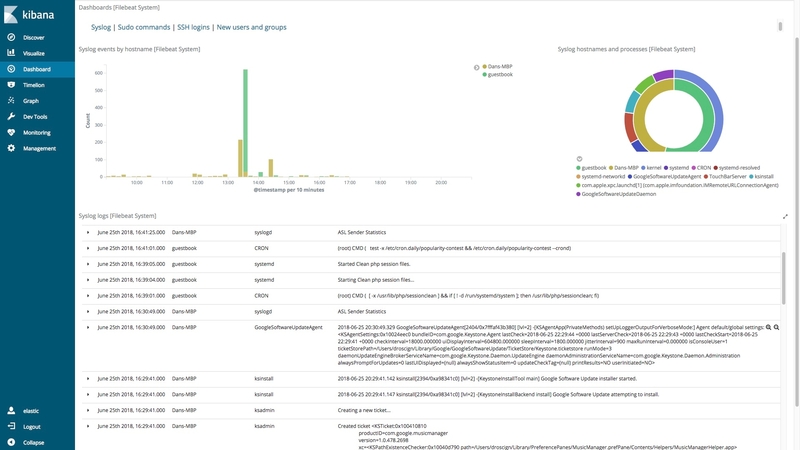 Visualizations and Dashboards got added to Kibana — At the top of this post the default Filebeat System Syslog dashboard was shown. 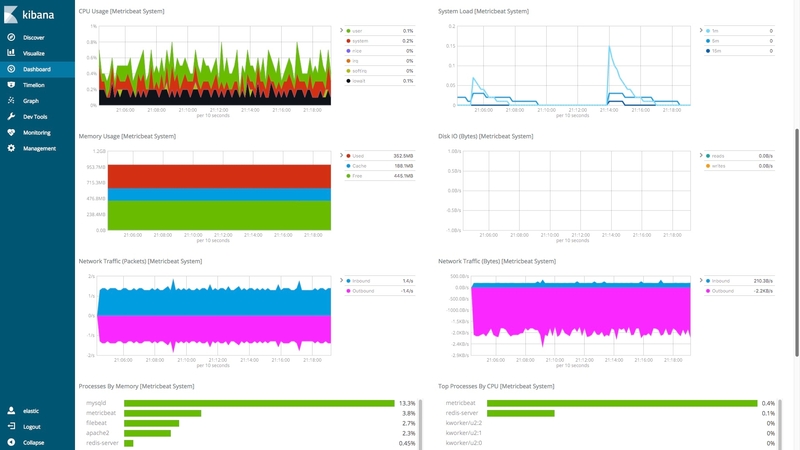 This and other dashboards were deployed into Kibana when the setup command was run. 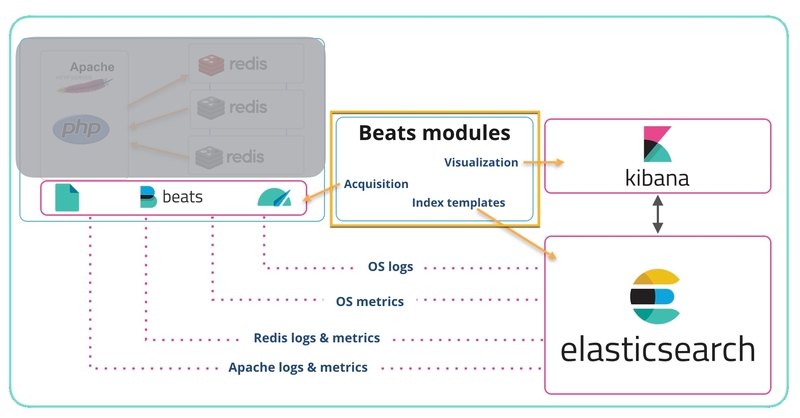 You should have data flowing in now, so open the Kibana Dashboards navigation, and pick one of the dashboards related to the Beat and modules that you deployed.